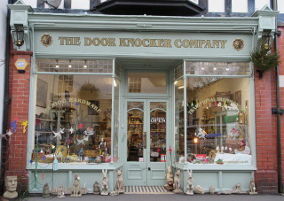 The Door Knocker Company is located in the busy market town of Church Stretton in the beautiful south Shropshire hills. We supply British made brass and iron architectural period fixtures and fittings, including door knockers, door knobs, hooks, shelf brackets, finger plates, hinges, bolts, key escutcheons, door keeps, wrought ironware, cupboard door furniture and other paraphenalia for the home and garden. Our worldwide customers include collectors and interior designers as well as people who just want to improve their own home. We try to keep our range, quality and service to the highest standards. By supporting local foundries we can supply better quality and make sure our prices stay competitive. Making a purchase could not be easier. Just browse our store, and add any items that you wish to buy into the shopping cart. After you have finished your selection, click on 'Checkout Now' and you will be asked for a few details that we need so we can complete the order. We accept Visa, Mastercard and Maestro cards. To pay online, select "Credit / Debit Card" as your preferred payment method. You will be directed to the payment page so that you can enter your card details securely and in compliance with the current PCI (Payment card industry) guidelines. We accept payment by Paypal. Just select "PayPal" as your preferred payment method on the checkout page and you will be transferred to the PayPal website to complete your payment. You can also pay by cheque or give your credit card information over the phone. Just select "Invoice and payment before delivery" as your prefered payment method and we will send you an invoice. Then send us your payment and once it has been cleared your order will be dispatched. If you are shopping from outside the United Kingdom, place your order and your credit / debit card company will convert the transaction to your own currency. The Door Knocker Company Ltd are completely dedicated to your total satisfaction. If you have any suggestions or comments please email us using the Contact Us link.